Irish short films ‘The Crush’, from director Michael Creagh, and ‘Shoe’, from director Nick Kelly, have been announced among the 10 live action short films advancing in the voting process for the 83rd Academy Awards®. Seventy-six short films from across the globe had originally qualified in the category and the selected ten will now be viewed by the Short Film and Feature Animation Branch Members of the US Academy who will then shortlist three to five nominees for the prestigious 2011 Oscars. ‘The Crush’ is written and directed by Michael Creagh and produced by the ‘Hole In The Wall Gang's Damon Quinn at Purdy Pictures, The story sees an eight year old schoolboy (played by newcomer Oran Creagh) fall in love with his teacher, Miss Purdy. One day he gives her a toy ring to show his affection. But heartbreak awaits when he bumps into Miss Purdy and her boyfriend having just bought a very real engagement ring. Devastated and spurned, Ardal challenges Miss Purdy’s fiancé to a duel – to the death! Other cast includes Olga Wehrly (Rásaí na Gaillimhe), Rory Keenan (The Guard), and Neili Conroy (Kisses). DOP was Jim Creagh (Last Man Hanging) and editor was Ciara Brophy (The Widow). ‘Shoe’ is an IFB funded short film from director Nick Kelly and producer Seamus Byrne of Zanita Films. 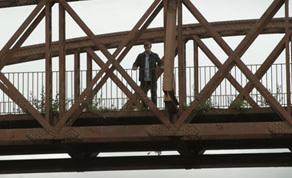 The darkly comic film tells the story of Vince who is about to kill himself - but a crazy beggar keeps killing the mood! The short stars Peter Coonan and Pat Kinevane (King Arthur) and was filmed on location in Kilorglin during July 2010, DOP was David Grennan (Eamon) and editor was IFTA winner Mairead McIvor (Savage). Previously, Irish short films have fared well in the US Academy Awards. Martin McDonagh’s ‘Six Shooter’ picked up the top prize in 2006, with Steph Green’s ‘New Boy’ and Juanita Wilson’s ‘The Door’ receiving nominations in 2009 and 2010 respectively. The 83rd Academy Awards nominations will be announced live on 25 January 2011 with the winners announced on Sunday, February 27th.